FOXBORO, Mass. 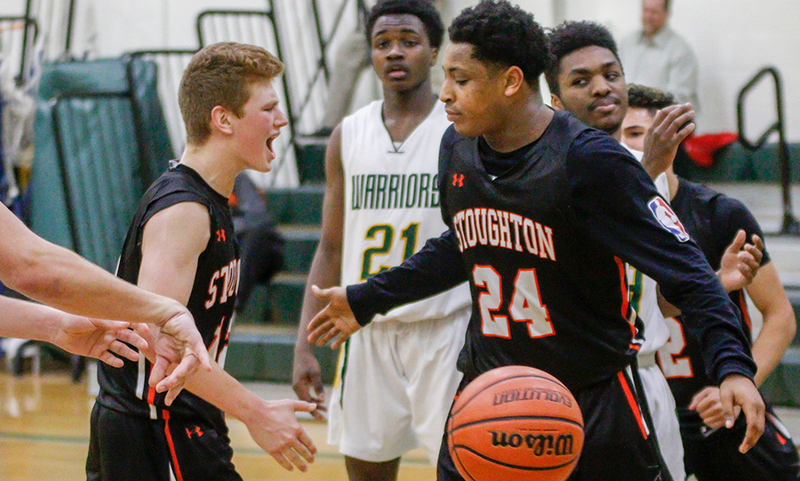 – While the Stoughton Boys basketball team spent the majority of Friday night’s contest trailing Foxboro, the Black Knights never let the Warriors run away with it. Staying within striking distance for the majority of the game, the Black Knights made their move late in the fourth quarter. Stoughton used an 8-0 run to tie the game with just over two minutes to play, and finished the game with a 9-0 burst. All in all, Stoughton outscored Foxboro 17-0 over the final 4:24 to stun the Warriors with a 63-52 decision. The win moves Stoughton into a four-way tie in the Davenport division along with Foxboro, Milford, and North Attleboro with two division games left. Foxboro junior Dylan Barreira drained a three to put the Warriors up 53-45 with 4:43 to go. It marked the seventh time that the Warriors had led by eight or more points in the game. But similar to each of the previous times, Stoughton clawed its way back in. This time, however, the Black Knights were able to tie the game. Junior Thomas Sanda (eight points) scored on a shot from the block, junior Ajahn Rue (13 points, five rebounds) beat his man and attacked the rim on two straight possessions, and senior Kevin Dixon had a strong take to make it 53-53 with 2:07 left. Foxboro called a timeout to try and stem the tide, but Stoughton junior Ahmad Jahed stole the inbounds pass and found Dixon for an easy bucket and the lead. The Warriors came up with an offensive rebound on its next possession, but Rue was able to knock the ball free for a turnover. Rue once again went to the basket, this time sneaking a layup under the defender for a 57-53 advantage with a minute to go. The Black Knights continued to get stops, including a big block from Obinna Ugwuakazi. Ugwuakazi, Jahed, and Rue each hit from the free throw line down the stretch to get Stoughton to the final score. “The lead never felt comfortable, but there were moments I felt we could put them away if we maybe made a couple more shots in a row or a couple of more plays [defensively],” said Foxboro head coach Jon Gibbs. “It seemed like we could never make that last momentum play. We’ve got a young group, so we have to go back to the film and see what went wrong and learn to execute better down the stretch. That’s how our league is, every game is going to be like that. Foxboro had leads at 15-7 to end the first quarter, 23-15, 26-18, 28-18, and 30-20 in the second quarter, and a 38-29 advantage midway through the third quarter. Stoughton was able to respond each time, cutting into the deficit to get within five or three before Foxboro could pull away. Rue was limited to just two points (on four field goal attempts) entering the fourth quarter, but seemed to flip the switch to get the Black Knights going. Even before sparking the comeback run, Rue gained confidence by converting a traditional three-point play early in the fourth quarter. He had 11 of his 13 points come in the final frame. Foxboro junior Brandon Borde (23 points, nine rebounds) had his way for the most part, scoring seven points in the opening quarter to help the Warriors create a 15-7 lead. The Warriors used a 13-5 run to create a 10-point lead with a minute to go in the half. Borde had three baskets, Ryan Hughes added two field goals, and Will Morrison (10 points) drained a three. 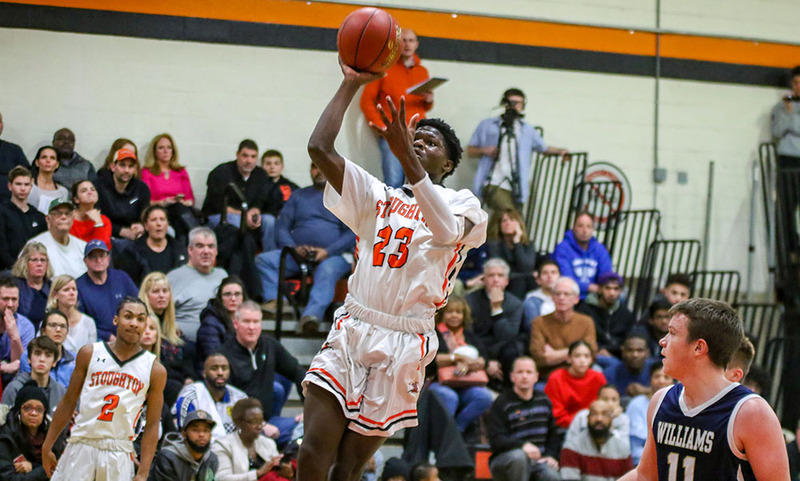 Stoughton got some momentum back before the half as Tahkwan Gates Brown (nine points, four rebounds) converted a putback and Myles Grigalunas-Powell drained a three after an offensive rebound from Gates Brown to make it 30-25 at the half. A three from Foxboro sophomore Kevin Gallagher sparked an early 8-0 run for the Warriors, with Borde adding two field goals and Morrison with a free throw to put the hosts up 38-29. But as they had done all game, the Black Knights battled back, closing the quarter with an 11-5 run. Zak Paquette sank two free throws, Jahed scored after a steal, Dixon hit a pair from the line, Gates Brown scored down low, and Sanda made both ends of a one-and-one situation to bring the Black Knights within three, 43-40, entering the fourth quarter. Stoughton boys basketball (6-8 Hockomock, 9-9 overall) hits the road on Tuesday to take on Milford. Foxboro (6-8, 9-8) will look to snap its two-game skid when it travels to Sharon on the same night. RANDOLPH, Mass. – The Stoughton boys basketball team felt like it had let a win slip through its grasp on Friday night against Natick in the opening round of the Blue Devils Holiday Classic. Facing a 17-point second half deficit, the Black Knights were starring at the possibility of a second straight loss against a team they were capable of beating. 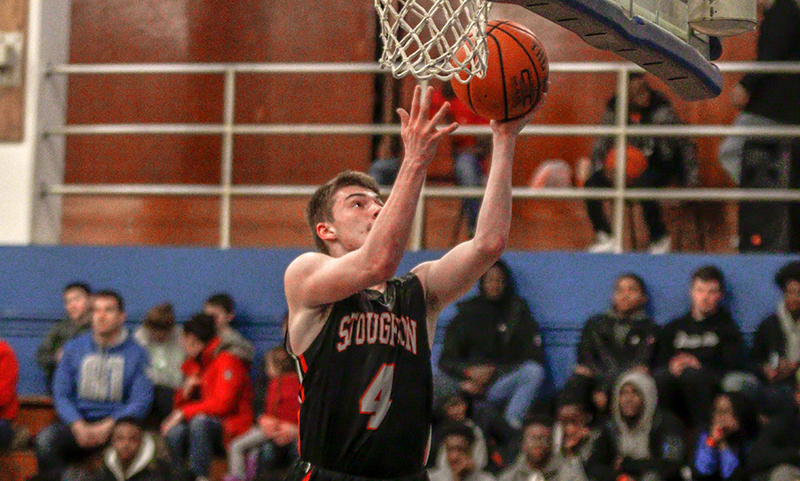 Behind a ramped-up defensive effort, improved shooting, and a big fourth quarter performance from senior captain Josh Cocchi, Stoughton erased that deficit and walked away with a 64-58 win over Weston. “We’re thrilled to get this one today because we knew we could have played better on Friday night,” said Stoughton head coach John Gallivan. A big second quarter gave the Wildcats a 37-24 advantage at the break. Weston extended that lead to 43-26 on a three-pointer by Jake Corbett with 5:44 to play in the third. Stoughton, which had struggled from the field in the first half (22% shooting) began to find its rhythm. A pair of free throws from junior Obinna Ugwuakazi (26 points, 12 rebounds, 3 steals) started a 10-0 burst for the Black Knights. Stoughton’s improvement on offense was almost a direct result from its defensive energy. The Knights extended a 2-2-1 press that forced Weston into four turnovers and 0-for-5 shooting from the field in that stretch. Ugwuakazi scored down low on an assist from Ajahn Rue after a Weston miss, and Myles Grigalunas-Powell scored on a break after Rue came up with a steal. Zak Paquette found Ugwuakazi for a tough two, and the press forced a turnover on a carry. A steal from Eddie Aldama led to an elbow jumper from Ugwuakazi to make it 45-38 with 2:28 left in the third. A three-point play from Weston pushed the lead back to 10 but a baseline drive from Paquette and a three-point play from Ugwuakazi with just 6.5 left brought the Knights within five but Weston beat the buzzer to take a 50-43 lead into the fourth. Ugwuakazi had 13 of his 26 points in the third quarter. 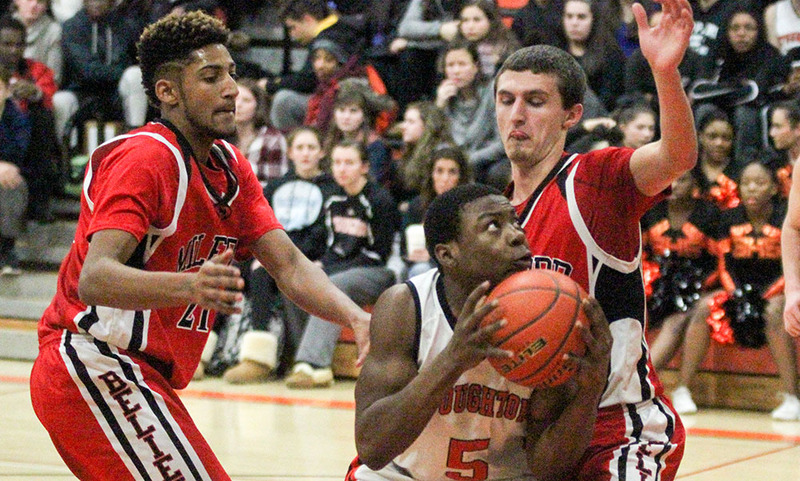 A free throw from Ugwuakazi was followed by a turnover by Weston — a travel forced by Stoughton’s pressure. Senior Josh Cocchi hit three-pointer for the Knights, making it a three-point game with 6:22 to go. It marked Stoughton’s first triple since 2:19 left in the first quarter. The Black Knights had shot 1-for-22 from deep before Cocchi’s make. Cocchi sank a pair of free throws to get within one but Corbett answered on the other end for the Wildcats. Cocchi came back down the other way, took a feed from Rue and drained another three while being fouled. He converted the free throw to give Stoughton its first lead of the second half, 53-52, with 4:32 to go. Weston briefly regained the lead on a three-point play by Corbett but Rue answered with a three on the other end to put Stoughton back in front, 56-55, with 3:49 to go. The Knights got a stop on one end with Ugwuakazi grabbing the rebound. On the other end, Rue found Ugwuakazi with a nice pass and he extended the advantage to 58-55. Cocchi hit one of two free throws after earning a trip to the line with a nice box out. Thomas Sanda came up with a key loose ball, and after a pair of empty trips from each side, Sanda took a nice feed from Cocchi for an easy two to make it 61-55. Cocchi (1-for-2) and Sanda (2-for-2) added free throws in the final minute to make it 64-58. Stoughton boys basketball (5-2) resumes Hockomock League play on Friday, January 4th when it travels to Davenport division rival Canton (2-1) for a 6:30 tipoff. STOUGHTON, Mass. – With a combination of experienced, young, and new players on the team this year, Stoughton head coach John Gallivan has yet to determine how the pieces of the puzzle best fit together. And while it may take a couple of games to integrate the team and find the best lineups at the right times, his most experienced varsity players stepped up in key moments to help deliver a 66-62 win on opening night against Archbishop Williams. Senior captain Zak Paquette scored nine of his career-high 16 points in the final quarter while junior Ajahn Rue (10 points) buried a three with under a minute left to help the Black Knights fend off a comeback attempt from the Bishops. “Zak had some big buckets for us in the fourth quarter and I thought the three that Ajahn hit by our bench late was huge,” Gallivan said. “It came right in the flow of the game and it was the kind of thing that should have happened instead of being forced. It was a gutsy shot when it should have been taken and obviously we needed it. While Archies had the strong start (11-2 lead in the first quarter), it was Stoughton that had success throughout the middle quarters. Paquette’s first triple of the game just under a minute the final quarter off a pass from Kevin Dixon gave Stoughton its largest lead at 55-39 and it looked like Stoughton was set to run away with the game. But Archies refused to go away, making it a single digit game (59-50) but the midway point of the quarter, and used a 7-2 spurt to get within four, 61-57, with just under two minutes to go. Stoughton responded with a key stretch, Paquette finishing underneath after a nice feed from senior Edward Aldama (four points, four rebounds) and then Rue came up with a steal to get possession back. Rue and Paquette combined for a two-man game in the corner, the passing resulting in a three from Rue and a 66-57 lead with 38 seconds to play. Archies took an early lead but Stoughton was able to claw back into the game and make it a one-possession game after eight minutes. After an emotional pregame ceremony that honored David Bell and Nick Joyce, two of four Stoughton students that passed away in a tragic accident last May. Bell was slated to be a senior captain this season and Joyce played of sub varsity last season but attended plenty of varsity games over the years watching older brother Kris Joyce (1,000 point scorer). Stoughton came out flying but the energy didn’t translate into points as the Bishops staked an 11-2 lead. From there, the Knights settled in and made a game of it. Rue, Myles Grigalunas-Powell, and Tahkwan Gates Brown (six points) came off the bench to help Stoughton get in gear. The Knights closed the quarter with a 7-2 run, highlighted by a pair of putbacks from Obinna Ugwuakazi (11 points, 10 rebounds) and a triple from Rue and trailed just 19-17 after one. 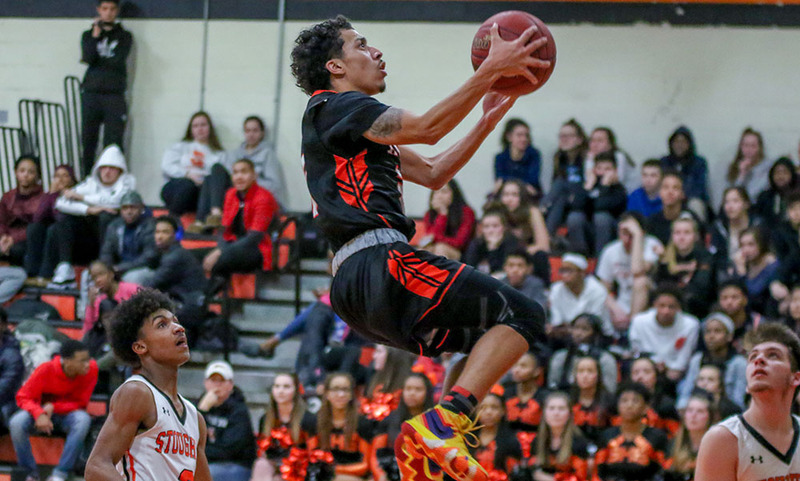 A three from sophomore Brett Pendenza and a midrange jumper from Ahmad Jahed helped Stoughton jump in front, a lead they didn’t relinquish the rest of the way. Paquette had a traditional three point and Josh Cocchi hit a pair of three throws to give Stoughton a 31-26 lead at half. Stoughton extended its lead by outscoring the Bishops 19-11 in the third quarter. Ugwuakazi had five of his points in the frame, Aldama scored a pair of buckets, Cocchi drained a triple wit just over a minute left in the third, and Kevin Dixon converted a putback at the to make it 50-37 heading into the fourth. Stoughton boys basketball (1-0) opens Hockomock League play on Tuesday with a trip to Oliver Ames for a 6:30 tipoff. WRENTHAM, Mass. – Throughout the game, Stoughton had struggled to score against King Philip’s half-court defense. So with 37 seconds left, holding a three-point lead and in need of some insurance, the Black Knights found a way to get an easy bucket. Coming out of a timeout after a near turnover and the inbounds at midcourt, Stoughton sent three of its players down one end of the court and kept Colin Sanda (17 points, 10 rebounds) alone in one half. The Warriors’ defense lined up in man-to-man, allowing Cam Andrews to get the ball into Sanda. It seemed like a normal inbounds play into the backcourt, but that was only because of how the Black Knights lined up. Sanda was, in fact, in his offensive half and took the feed down for a wide-open layup with just 30 seconds to play. That bucket, along with some late free throws, gave Stoughton enough of a cushion to hang on for a 60-55 win on the road. The Black Knights led by as much as 11 in the fourth quarter and had a nine-point lead with just two minutes to go before King Philip made a late charge. Kyle Layman (23 points, eight rebounds) scored inside and Brendan Kinghit a pair of free throws to make it a five-point game, 55-50. Stoughton hit a free throw to extend it to six but Layman collected three points (free throw, field goal off Bruce Santillus’ offensive rebound) to make it a one-possession game, 56-53, with just under a minute to play. That’s when Stoughton ran its play to Sanda for an easy two to keep the lead. King Philip once again got it down to three on an offensive putback but David Bell (career-high 19 points, 13 rebounds) hit free throws down the stretch to ice it. While the inbounds play and free throws iced the game for Stoughton, it was the Black Knights’ full-court pressure defense and strong rebounding that really put them in position to win in the first place. 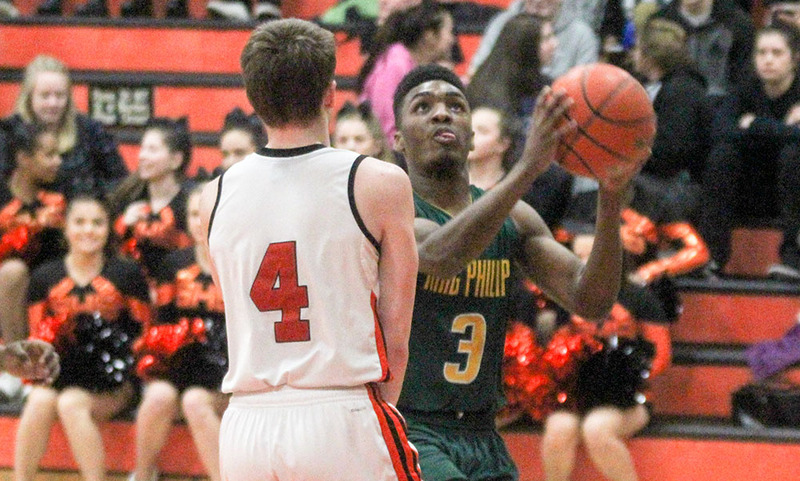 The Knights’ pressure really started paying off in the third quarter, and even more so when King Philip’s starting point guard Pharoah Davis had to leave the game for a stretch due to a head injury. Stoughton outscored KP 15-9 over the final six minutes of the third. Trailing 29-25, Stoughton forced a turnover that led to a triple from Bell. Stoughton had a miss a possession later but Sanda flew in for an offensive rebound and easy putback. Layman tied the game with a traditional three-point play but Stoughton finished the frame with a 7-0 burst. After another miss, Ruben Gonzalez came in for an offensive rebound and putback, Sanda made a jumper after KP missed the front end of a one-and-one, Andrews hit the first of two free throws for a 38-34 lead, and then Steevens Phelimond hauled in Andrews’ miss on the second attempt and put it back for a 40-34 lead heading into the fourth quarter. Stoughton started the fourth when it forced a turnover and Andrews found Bell for an easy two. Layman answered with a triple and Stoughton missed its ensuing shot, but once again Sanda came flying in unguarded and converted the putback. Holding a 44-38 lead, Stoughton’s effort on the offensive glass paid off once again. Its first shot missed but Bell grabbed the board and put it back up while being fouled. He sank the free throw for a 47-38 lead with 5:39 to play. Stoughton won the rebounding battle, 45-31. The Black Knights used the full press from the beginning of the game and forced 10 turnovers in the first half. While only four of those came in the first quarter, Stoughton’s defense mainly focused King Philip into bad shots. The Warriors shot just 24% in the first eight minutes (4-for-17) while going 0-for-4 from three-point range. Though King Philip’s offense struggled to find a rhythm, its defense kept them in the game and in the lead. Even though Stoughton made nearly half of their shots in the opening quarter, the Black Knights turned the ball over 11 times and trailed 11-9 after one. Stoughton took a lead, 14-13, on a triple from Phelimond but Santillus (17 points, 11 rebounds) caught fire to bring the hosts back in front. He converted a feed from King for two, drained a three on a feed from Tim Nault, and after Layman and Sanda traded basket, the junior splashed in another shot from downtown. Andrew McKinney capped the run with a runner to give KP a 25-16 edge. But the Black Knights refused to go away, closing the half on a 6-0 run to get within three at the break. Bell contributed three straight points and Andrews drilled a three with two minutes to go. Neither team scored in the final two minutes of the half. “It was 25-22 at halftime, there really wasn’t a lot of rhythm,” said KP head coach Mark Champagne. “We lost Pharoah for a stretch in the third, and then the other guys were tentative against it so [the press] did hurt us. Pharoah can create more against it so not having him hurt. But I thought our shot selection was poor, I thought we really regressed on that. We had the wrong guys shooting the ball, just because they were open doesn’t make it the best shot. While KP’s defense focused on Andrews (eight points), Sanda and Bell picked up the slack. Sanda tied a career-high while Bell set a new mark. Both had double-digit rebounds as well. Stoughton boys basketball (2-7 Hockomock, 3-8 overall) is back in action on Friday when it hosts Franklin. King Philip (2-7, 2-9) will try to bounce back when it visits Sharon on the same night. RANDOLPH, Mass. – With a pair of starters out, Stoughton head coach John Gallivan turned to senior Ruben Gonzalez to give the Black Knights a defensive spark. Not only did Gonzalez deliver a pesky defensive performance (three steals), the senior connected on five three-pointers and poured in a career-high 19 points to help the Black Knights pick up their first win of the season, an 80-60 decision over Randolph in the first round of the Blue Devils Holiday Classic. Stoughton will play Natick in the championship of the tournament on Saturday night. “What a spark he was,” Gallivan said. Gonzalez got Stoughton’s offense going early, scoring eight of the team’s 18 first-quarter points including a pair of triples. And when Randolph’s defense decided to face guard senior Cam Andrews (career-high 31 points, 10 rebounds, five assists) for the entire fourth quarter, Gonzalez helped put the game to rest with eight more points, again on a pair of threes. And in the two middle quarters, Andres took care of business. He scored 13 of his points in the third quarter, helping the Knights turn a seven-point lead at the end of the first (18-11) into a 36-23 advantage going into the halftime break. When Randolph had its best offensive quarter of the game, netting 24 points in the third quarter, Andrews was equal to the task, scoring 12 of his own in the quarter to keep the lead at 13 (60-47) heading into the final frame. The Blue Devils got within seven points just over the midway point of the second quarter, but Stoughton rattled off a 13-4 run over a two and a half minute span to build the separation it needed for the rest of the game. Gonzalez got the run started with his third triple, and Andrews blew by his defender with a strong take to the hoop for a layup. Stoughton’s press worked as Gonzalez came up with a steal in the Randolph backcourt and tossed up a pass for an easy alley-layup for Andrews. After a Randolph timeout, the Blue Devils got back on the board with a layup but Stoughton had a quick answer. After a miss, Sjoquist pulled in the rebound and found Andrews for the three, plus the foul, for a four-point play. It was the play that Gallivan alluded to. Stoughton capped the run when Gonzalez forced another turnover and Andrews finished at the rim once again. Randolph cut the deficit to single digits once in the second half, midway through the third quarter, but five straight points from Andrews restored Stoughton’s comfortable lead. 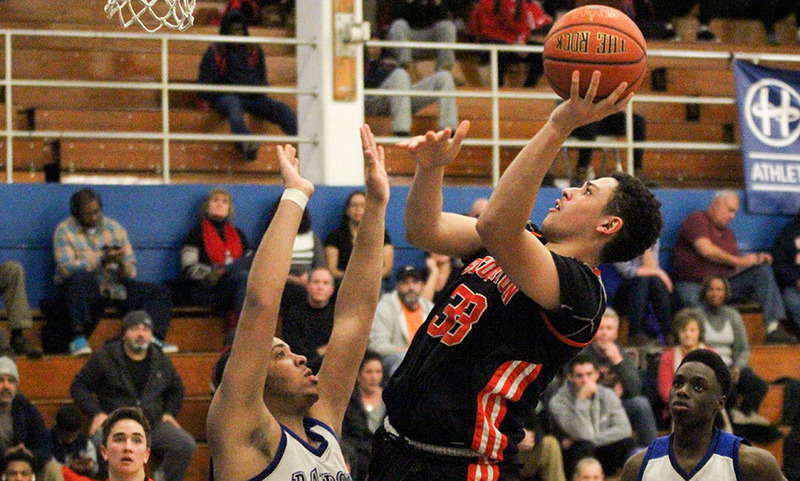 Colin Sanda added 10 points, six rebounds and four assists for Stoughton while Steevens Phelimond (six points, five rebounds) and David Bell (five points, five rebounds) gave the Knights a presence in the paint. “I think the important thing for us was to survive those first three Kelley-Rex games,” Gallivan said. 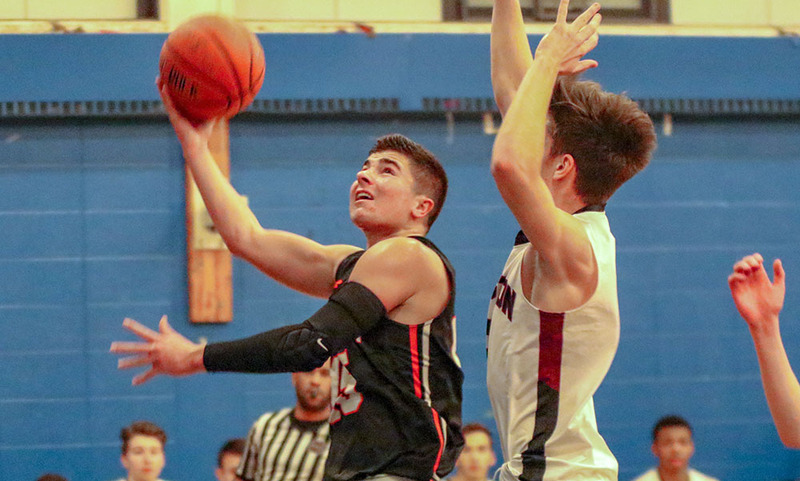 The Black Knights lost to Oliver Ames, Attleboro and Mansfield top begin the season; the three teams had a combined 9-3 record entering games on Thursday night. 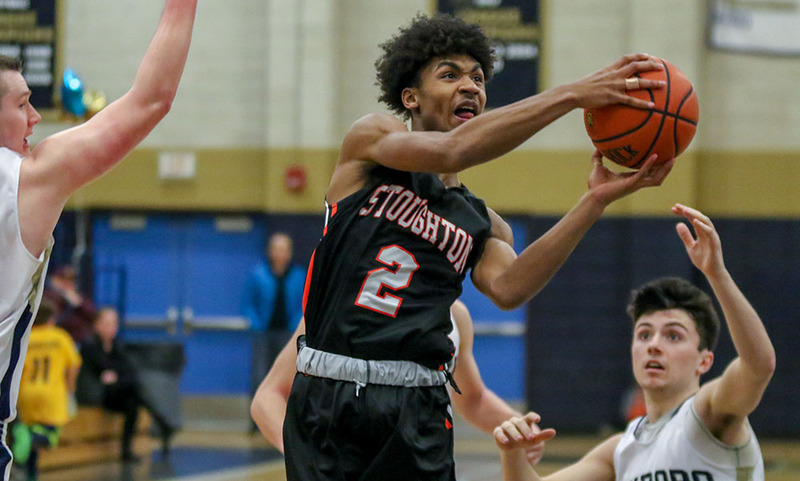 Stoughton boys basketball (0-3 Hockomock, 1-3 overall) will try to make it two in a row when it tips off against the Redhawks in the championship of the Blue Devils Holiday Classic on Saturday at 6:30. STOUGHTON, Mass. – After 16 minutes of play, Milford head coach Paul Seaver knew he needed to change something. Although his Scarlet Hawks trailed by just one, the defense was having a tough time stopping Stoughton junior Cam Andrews, who had 17 points by the halftime break. The change came in the form of an intensified defensive effort with a full court 2-2-1 press, a switch from man-to-man to a 2-3 zone and a strong focus on getting offensive from down low. Those changes resulted in a strong second half for the Scarlet Hawks and a 56-50 win over the Black Knights in both teams’ first Davenport clash of the season. Stoughton jumped out to an early lead but Milford chipped away and took its first lead, 11-10, behind a layup from Zack Tamagni (17 points) in the final minute. Andrews (20 points, seven rebounds) took control of the second quarter – a frame that saw five lead changes in the first minute alone before Stoughton held a slim lead the rest of the way. Andrews shot 4/5 from the field and 4/4 from the free throw line for 13 points in the quarter. Tamagni helped keep the Scarlet Hawks close, registering eight points in the frame while Zach Tomarro hit a late three to bring Milford within one, 27-26, at halftime. With the changes installed to start the second half, the first four minutes when nearly as perfect as Seaver could have hoped for. Milford’s zone disrupted the rhythm of Stoughton’s offense as the Black Knights went 0/5 from the field and had four turnovers in four minutes. Meanwhile on the other end, Milford’s game plan to get junior Kayden Kelley (16 points 11 rebounds) touches was working. Kelley went 4/6 to start the quarter, including a put back off a miss for an 8-0 run of his own to start the second half. Cam Gomes (13 points, 10 rebounds) converted a traditional three point play to break Stoughton’s scoreless skid but Kelley came back down the other end with another post basket. Stoughton’s Matt Valle (eight points) drained a three late to cut the deficit to four but a pair of free throws from Milford’s Brendan White gave the Scarlet Hawks a 41-35 lead going into the final quarter. Tamagni had four points in the first three minutes of the final quarter while Gomes had a pair of free throws. With Milford leading 45-37, Tammaro stepped up to bury a three on back-to-back possessions and the Scarlet Hawks took a 51-37 lead with four and a half minutes to go. Milford was able to keep a 10 point cushion for the rest of the way until Stoughton scored four points in the final 30 seconds. Milford boys basketball (4-3 overall, 2-2 Hockomock) return to action on Tuesday with a visit from Canton. Stoughton (1-5, 0-4) will try to bounce back on the same day when it hosts Foxboro. RANDOLPH, Mass. – Through three quarters, Randolph held a significant advantage on the boards and a four point lead on the scoreboard. But over the final eight minutes, on the back of senior captain Ryan Sullivan, Stoughton dominated in the rebound category, which translated into a 60-56 win over the Blue Devils. Trailing 56-55 with less than a minute to play, Sullivan came down with his fourth offensive rebound of the quarter off a missed layup. Instead of going right back up in traffic, Sullivan spun around and found a wide open Colin Sanda, who drained the go-ahead three pointer with 30 seconds to play. Sanda came down with the rebound on the other end off a missed three from Randolph, who had to foul. Stoughton missed both free throws with 12.8 seconds to play but Sullivan muscled his way to his fifth offensive rebound of the quarter. He quickly found Cam Andrews, who was fouled. Andrews drained two free throws with 7.8 seconds to play to ice the game. Sullivan finished with 10 rebounds, seven of which came in the fourth quarter. Stoughton and Randolph finished with 28 rebounds apiece despite the Blue Devils holding a 24-16 advantage through three quarters. While Stoughton’s offense stalled over the final couple of minutes, the Black Knights relied on an extended 3-2 zone, keeping the Blue Devils scoreless over the final three minutes of the game. Stoughton had kept Randolph in check with the zone through the first half but switched to man-to-man in the third quarter. Gallivan elected to go back to the zone with just under four minutes to play and Randolph scored just four points. The Knights got that turnover with just under a minute to go, with led to the sequence of Sullivan’s rebound and Sanda’s three point. It was Sanda’s second triple of the game. After Stoughton went just 2/15 in the first three quarters, Sanda stepped up early in the fourth quarter. With Randolph up 46-42, Sanda hit a three to cut the lead to one with just under seven minutes to play. Randolph’s Davon Robinson (22 points, 10 rebounds) gave the Blue Devils their largest lead at 52-47 with five minutes to play. But Stoughton answered right back as Cam Gomes (nine points, six rebounds) drew a double team and found a wide open Matt Gallagher (four points, three assists, three steals) for an easy layup to get within a possession. Gomes hit two free throws to get within one but Robinson answered with a bucket inside. Andrews (21 points, five rebounds) came back with a traditional three point play to tie the game, 54-54, with 3:15 to play. Stoughton boys basketball earned its first win of the season with the victory, improving to 1-4. The Black Knights first four opponents had a combined 17 wins entering Friday night’s games. After a difficult 2015-2016 season, the Bulldogs are looking to build on a strong offseason to have successful season this time around. Canton returns a strong core group that has a year of varsity experience under their belts now. Junior Tony Harris had a strong sophomore year, leading the Bulldogs in scoring with 13.6 points per game and should be a big factor on both ends of the court this season. Sophomore Devin Foster had a terrific freshman season and will pair with junior Jake Verille, who saw plenty of time a year ago, to form an experienced backcourt. 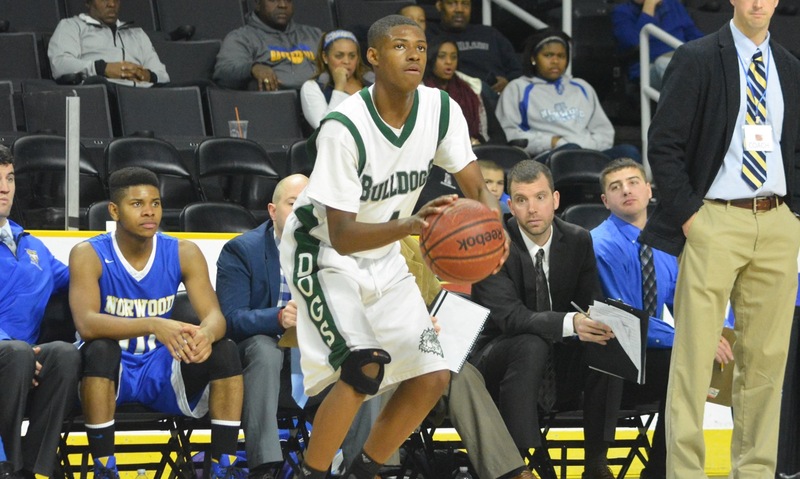 The Bulldogs will rely on that experienced back court to pace the offense. Canton has a handful of weapons that can connect from deep as well. Defensively, expect Canton to rotate small and big lineups, depending on the matchup. Out of all of the teams in the Davenport division, the Warriors certainly have the most holes to fill from a year ago. HockomockSports.com First Teamer Alex DuBrow (15 PPG, 7.1 APG, 2.8 SPG), leading scorer Jason Procaccini (16.3 PPG) and leading rebounder Robbie Lowey (10.2 PPG, 8.2 RPG) all graduated. The good news is that Foxboro does have some players coming back that have varsity experience, including Joe Morrison, Jamaine Few, Andrew Block and Mark Clagg – his fourth year on varsity. Freshman Brandon Borde could make an impact right away for the Warriors as well. The Warriors will continue to prioritize defense and rebounding again this season but the offensive game will have to change. Without their top three scorers, Foxboro will rely on sharing the ball and a balanced scoring attack for this season. After making a big jump in wins last season, head coach Paul Seaver and his Scarlet Hawks are looking to continue that trend in the 2016-2017 season. Milford qualified for the state tournament for the first time since 2013 a year ago and are looking to make it two seasons in a row. One big challenge will be replacing some of the scoring that graduated. Leading scorer Dimitry Torres (14.5) and second leading scorer Dwight Anderson (12.7) both are gone but senior Zack Tamagni, who scored 10.4 points a game a year ago, is back to lead the Scarlet Hawks this season. Tamagni, who will pace the offense from the point guard position, will be helped along by senior Anthony Arcudi, who saw plenty of minutes a season ago, and junior Kayden Kelley, who begins his third year on varsity. Arcudi will help replace some of the outside shooting that graduated while Kelley will give Milford a presence in the post. Tamagni can score from multiple spots on the court and his ability to move the ball and find the open teammate will pay dividends this season. A switch to the Davenport division might have come at the perfect time for the Rocketeers, who have a strong core of experienced players looking to make a push for the postseason. The Rocketeers have seven varsity players back from a year ago, including seniors Brent Doherty and Jonny Friberg, who have both started since their sophomore seasons. Doherty was third in scoring in the Hockomock a year ago with 16.8 points per game, as well as 4.2 RPG and 3.0 APG while Friberg offered Big Red rebounding (5.8 RPG) and a post option on offense (8.8 PPG). Doherty and Friberg have a strong supporting cast with Kyle McCarthy, Chad Peterson, Tom Reynolds and Hacmoni Cuevas all getting plenty of minutes last season. The Rocketeers deployed more man-to-man defense a year ago after relying on zone the year prior. Expect Big Red to mix it up this year, and with experience using both, the defense could be a solid weapon. Sharon is bringing back just three players from a year ago so the Eagles will be relying on new faces to step up for the 2016-2017 season. Though just three players are back, three-year starter Ricardo Ripley is one of them. His experience and skill will be vital, quarterbacking the offense and leading the charge defensively. Both Jimmy Fitzhenry and Malik Lorquet picked up varsity experience last year and will likely see expanded roles this year. Expect the Eagles to use their speed and athleticism on both ends of the court to try and bother teams. Offensively, Sharon has a couple of shooters that can help space out the floor, which can provide Ripley with the space he needs. The Black Knights will be relying on a big senior class in the 2016-2017 while trying to get back to the postseason and make a push for the division title. Stoughton has 10 seniors, including captains Ryan Sullivan, Cam Gomes and Matt Valle. Junior Cam Andrews is also a captain for the team. The Black Knights were able to give teams problems with their pace last year and will look to do the same again this year. With plenty of athletes, the Black Knights will use their speed to try and run past teams while applying lots of pressure on the defensive end. Andrews (12.9 PPG as a sophomore) is one of the top returning scorers in the league and can be a handful for defenses to deal with.